If you've been reading this blog for any length of time you'll know that I love free motion embroidery. I love doing it, and I love teaching it. For me, it's sewing in its most relaxing and freeing form. It's perfect if you've just got an hour or so to spare, not enough time to make a garment (maybe a very simple jersey top), but plenty of time to make a little picture. 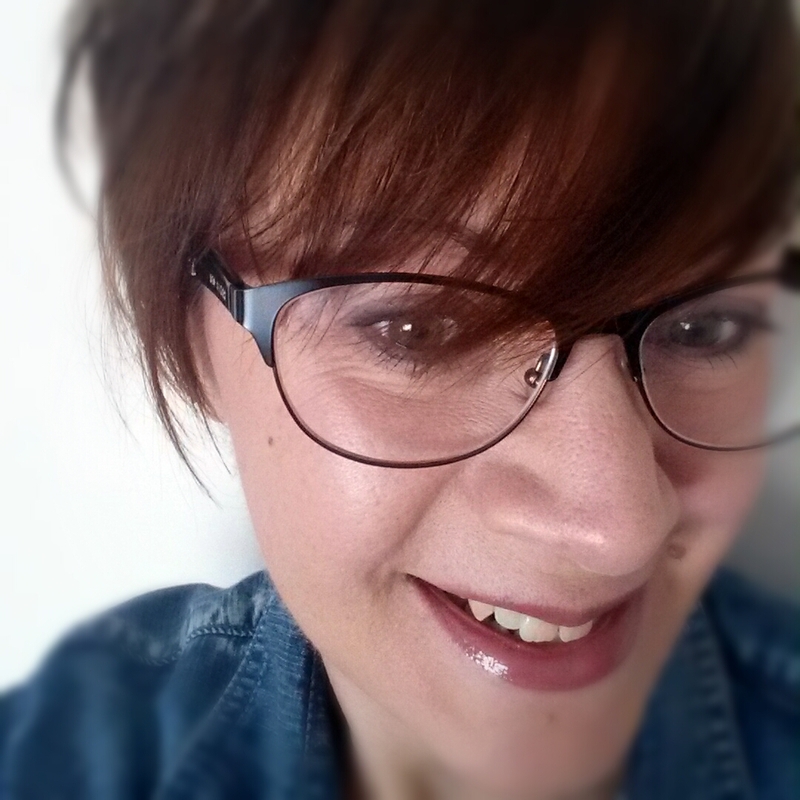 I find it very calming as well, perfect for those days you're feeling a bit anxious and stressed and think that the precision and accuracy needed for dressmaking will add to that anxiety and stress. With free motion embroidery it doesn't have to be perfect, in fact imperfections add to the charm as far as I'm concerned. But you do have to concentrate, so those racing thoughts have to stay in the background. Recently I've become slightly addicted to doing free motion embroidered portraits and I thought it would be good to share with you what I think makes a good subject and some tips that might help should you want to try your own portrait. 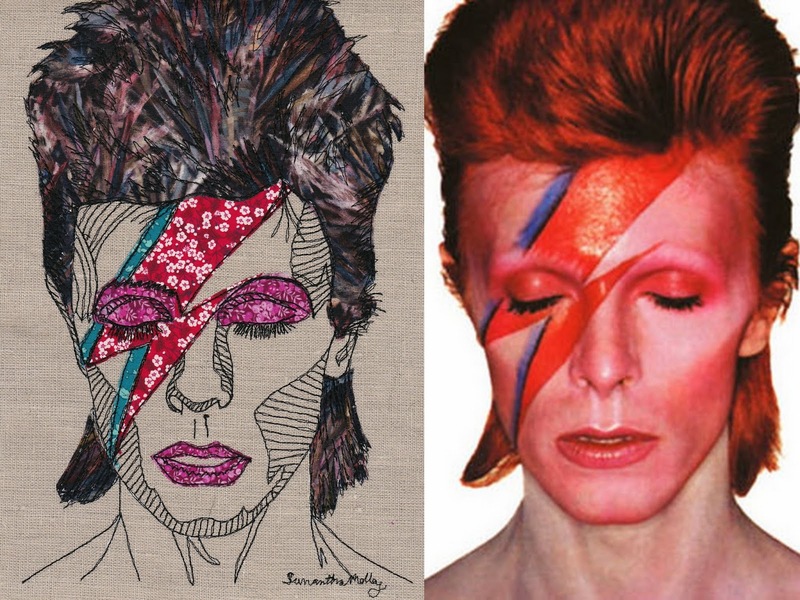 I've stuck to celebrity portraits - I find something weird about sewing (or drawing when I used to draw) people I know for some reason - but of course you can do anyone you choose. Bearing that in mind, tip one would be choose a recognisable subject. This probably sounds obvious, but choose someone that you - or the recipient if it's a gift - will recognise. Of course if you're doing the portrait, you'll know who it is, but choose a good, clear picture of them. I like to do full face portraits, but profile ones would work too. This one was the first one I did. If you don't recognise him, it's Ricky Wilson from Kaiser Chiefs in his guise as a coach on The Voice. At the time I was quite pleased with it, but now I think it could be much better. The main reason I don't like it is there's no definition in the face, it's too flat and one dimensional. Also I stretched it a bit when I mounted it which hasn't helped! Contrast that one with this one of David Bowie - my favourite portrait to date. I think this one works much better for several reasons. Firstly, it's an instantly recognisable image - I doubt there are many people who wouldn't know who this is, or at least recognise the image even if they didn't know who it was. Secondly, the shapes and angles are very well defined; sharp cheekbones, angular chin, the distinctive lightening flash makeup. It also lends itself well to using patterned fabrics and non realistic colours. The fabrics I've used here are all Liberty of London scraps. My second tip is angular faces work best (for me at any rate), as do images with a good contrast of highlights and shadows. 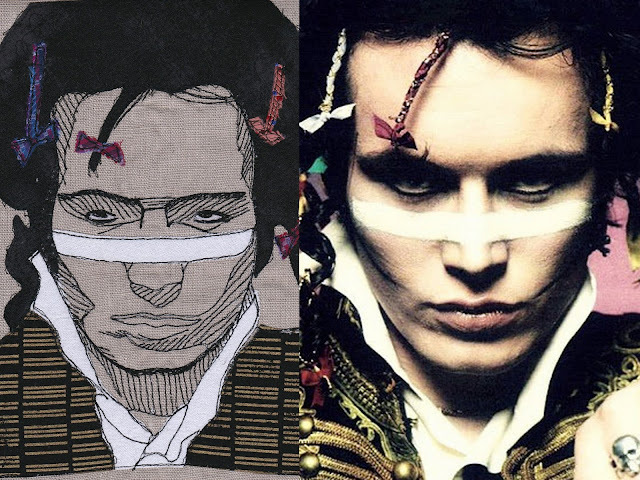 Adam Ant was another good choice as he's got such a distinctive look. This one was a birthday present for a friend. The fabrics you use can be as realistic and as close to the original image as you like, or something far away from the original image. The black and gold quilting cotton I chose for the jacket echoes the gold braid in the photo meaning it was simpler to stitch. I could have chosen a plain black fabric and overlaid gold braid or fabric strips for a different look. Tip three is therefore, bear in mind the less you match the fabrics / colours to the original photo the less recognisable your finished image is likely to be. 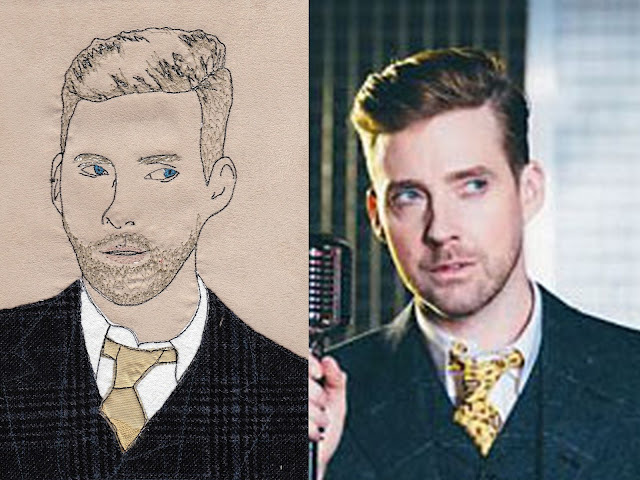 Imagine my first portrait of Ricky Wilson in Liberty Print fabrics, you'd have even less of an idea who it was! Tip four: use a skin toned fabric or similar for your backing if you can. It means you don't have to worry about cutting the face from fabric. Of course, you don't have to do this! 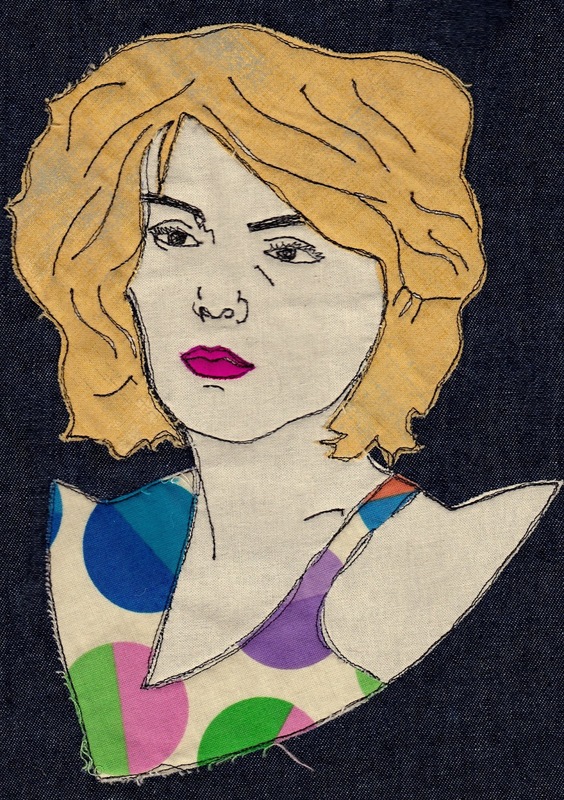 Here's Debbie Harry on a denim background (actually a bag). I used some cream calico for the skin toned parts of the image. I like this one, but I think it would have worked better if I'd added some shadows or shading to shape the face more. She has quite an angular face, and amazing cheekbones, that you don't see in this portrait. My final tip is to allow plenty of time. Although I said at the start of this post free motion embroidery is a great way to fill an hour, don't expect to achieve a detailed portrait in that time. 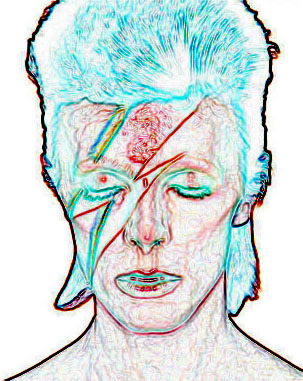 The David Bowie one took about 5 hours from start to finish. I hope you've found the above useful or at least interesting. For those of you who aren't into this type of sewing, I apologise for not writing that much about dressmaking recently. I hope to get back to blogging about that too, but for various reasons I've probably mentioned here before I'm finding it much harder to write about and photograph.